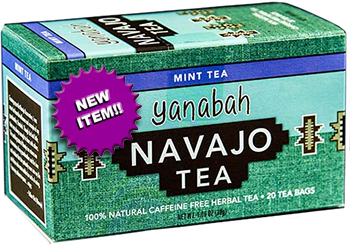 Yanabah's Mint Navajo Tea is a wonderful mix of flavors from right here in America. YANABAH MINT NAVAJO TEA: Yanabah's Mint Navajo Tea is a wonderful mix of flavors from right here in America. We combine the herb Greenthread, used by the Navajos for centuries, and just the right amount of Peppermint and Spearmint, grown in the rural soil of Ohio. It makes for a great tasting, caffeine-free, herbal tea. From the heartland of the Navajo to the country roads of the Amish and Mennonites, comes a flavor that makes your world turn a little slower and life a little more enjoyable. Contains: Greenthread herb, peppermint, and spearmint. 100% natural. Caffeine free! 20 tea bags.